What happens when your youngest is a Senior and they have a lot of school spirit?... 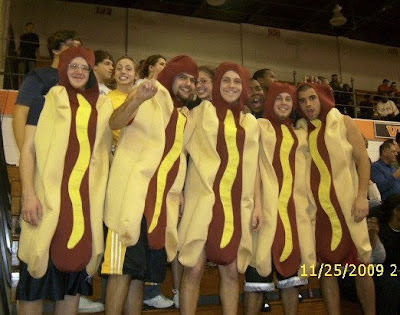 well they all get together and dress like hotdogs to go to the high school basketball games... I don't know why... makes total sense to them! Then during half time they have hot dog races down court.... LOL.. my son is the second from the right. The rest of the boys are all good friends of his.